Just finished the head of the screw I'll be using everywhere on the console pieces! 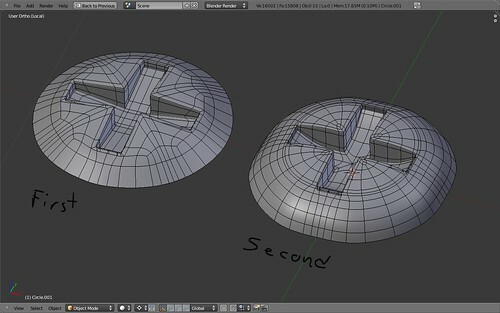 Planning your topology ahead of time really helps. Took about as long to make both, but I took a bit more time to think about the topology I needed before actually starting on the second cap, which really made a difference. I usually do a 50/50 of topology planning and topology improvisation/tweaking. That corner on the inside of the bit-head was kinda tough though - I ended up incorporating it's sharpening edge-loops into it's structure instead of them being easily removable and editable. You'll probably be done with this before April 2010... Anyway, waaaaaaaaaay before Skyward Sword is out (which I think they'll delay to make more sales). Didn't I say this already? LOL I remember I did! Thanks for letting me advertise my blog on yours, MW. P.S. I was thanking about writing a tutorial on making screws with the 'spin vertex' option, but I couldn't figger it out, let alone write a tutorial. Hey, I'm making an all-on-youtube nintendo emulator called SpeedNES. http://www.youtube.com/view_play_list?p=9086FBA3C92C7276 Since you did this on youtube can I use your nes model to create a nice logo for SpeedNES?